Cover and carry both your Big Book and 12 x 12 together in this stylish and convenient faux leather alcoholics anonymous book cover! 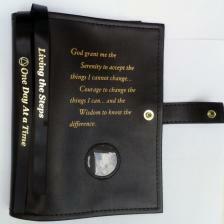 The Serenity Prayer is displayed on the front of the AA double book cover with built in book markers and a coin holder slot to showcase your favorite medallion or current birthday coin, which you can change every year. Alcoholics Anonymous Book Cover is for use with the regular hardcover editions of both AA books. (Big Book, 12X12 and Medallion shown sold separately).